It is impossible to escape the feeling that, in the West, something has changed. Conferences that might ten years ago have been on, “How to preach expository sermons” or “giving youth work the X-factor,” now have more sober calling cards: “Facing the crisis,” “Not in Kansas Anymore,” and “Engaging the Secular Space”. Books with titles like Strange Days and The Benedict Option and podcasts about This Cultural Moment have nudged the more sunny “How-To” guides of the late 1990s off the shelves of the local bookstores and the subscription list on our iPhones. Charles Taylor’s magisterial study A Secular Age has had as many accolades heaped upon it as any book could reasonably expect. But if I may be permitted to add one more, I would note its prescience. It was published ten years ago last year. It could have been written yesterday. And in 2018, if it didn’t already exist, someone would need to invent it. 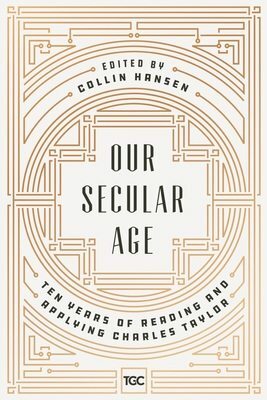 In honour of this ten year anniversary, Collin Hansen has brought together Our Secular Age: Ten Years of Reading and Applying Charles Taylor. It is a fantastic collection. The book marshals together theologians such as Carl Trueman and Michael Horton, ministry practitioners such as John Starke, and (wonderfully) theologically-engaged writers serving in the secular world, such as medical doctor Bob Cutillo. Trueman’s essay provides some important critical analysis of Taylor. So lauded is Taylor in most evangelical circles that it is refreshing to read an appreciative but robust account of what Taylor’s Roman Catholic faith brings to the table, and what a confident protestant critique might look like. This is the part Trueman was born to play, and he plays it beautifully. Another highlight is Bruce Riley Ashford’s learned essay, “Politics and Public Life”. Here Ashford critiques what has become the folk-reception of Taylor’s thesis. Popularly understood, Taylor can be heard to say that we all once lived in an enchanted universe, shaped by knowledge of the transcendent and porous in our openness to the unseen world. Western society took a misstep, constructing a closed universe, with an immanent frame and buffered selves. The job of the church is now to move people back to the former state of affairs. Ashford’s essay leads the reader through a more complex and critical assessment of the world we left behind. My highlight, however, was Mike Cosper’s concluding essay, “Piercing the Immanent Frame with an Ultralight Beam: Kanye and Charles Taylor”. Bringing Kayne’s “Ultralight Beam” into this conversation is a move of which you immediately think, “I should have done that!’. But you didn’t. And Mike Cosper did. And he does it with verve and insight. When I first got this volume, I wondered if it was going to be a much needed “how to” guide for pastors, church planters and gospel-operatives in our cultural moment. It’s not that: it is an appreciative, critical and intelligent series of evangelical engagements with Taylor’s work. I don’t think James K. A. Smith’s How (Not) to be Secular is really that “how-to” guide either. Perhaps that’s what Mark Sayers is doing for us? At any rate, for this Bear of Little Brain, if anyone would care to write a genuine Taylor for Dummies, you can count on me for a purchase. This is an excellent collection. I highly recommend it.